The compensation structure is geared toward the sustainable growth of the Company by factoring in compensation components with a multiple-year assessment basis. The total compensation of individual members of the Managing Board is specified by the Supervisory Board based on a performance assessment, taking into account any payments made by Group companies. Criteria for determining the appropriateness of the compensation are the responsibilities of the individual member of the Managing Board, their personal performance, the economic situation, the performance and outlook of the Company, as well as the level of compensation usually paid, taking into account peer companies and the compensation structure in place in other areas of the Company. At its professional discretion, the Supervisory Board can make decisions as regards special payments for the outstanding achievements or successes of a member of the Managing Board. 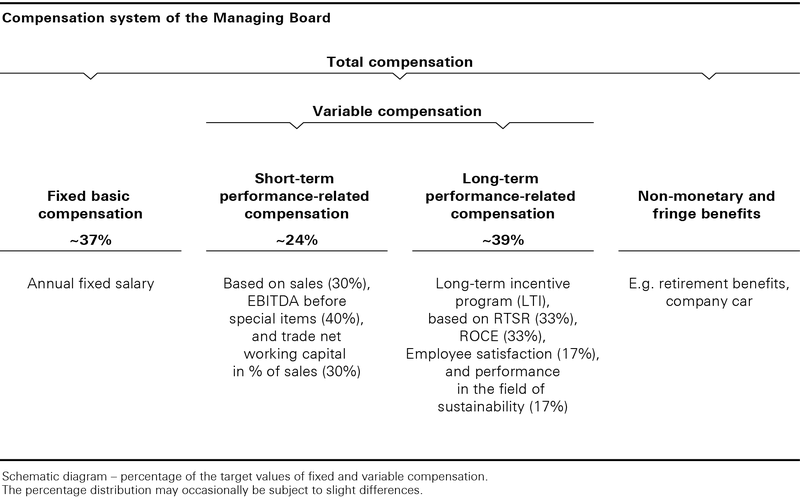 The compensation system aligns the Managing Board’s compensation to the Company’s sustainable growth by means of setting relevant targets for long-term variable compensation. At the same time, sales, EBITDA before special items and trade net working capital in proportion to sales are the target components of short-term variable compensation. This is intended to ensure a better response to short-term developments. Also, during the design process, a great deal of importance was attached to the fact that above-average performance would be rewarded more comprehensively, but variable compensation would cease to be paid in the event of below-average performance. In addition to non-performance-related (fixed) compensation components, the compensation structure has provided for core performance-related (variable) compensation components in the form of a short-term incentive program (STI) and a long-term incentive program (LTI). In this regard, the average share of the fixed compensation components in the total target compensation amounts to 37%, while the average share of compensation from the STI and from the LTI come to 24% and 39% respectively, whereby a target achievement of 100% each is assumed for the information for the STI and the LTI. The fixed compensation components consist of a fixed basic compensation, fringe benefits and contributions to retirement benefits. The fixed basic compensation is paid as a monthly salary. Members of the Managing Board also receive fringe benefits to a small extent which they individually pay tax on as per the applicable tax regulations if they derive any financial advantage from private use of the same. The fringe benefits primarily include private use of the company car, supplementary payments to health and nursing care insurance, the conclusion of and contributions to accident and directors’ and officers’ (D&O) liability insurance as well as, to a small extent, other equipment and services needed to fulfill their duties as members of the Managing Board. In accordance with Sec. 93 (2) Clause 3 AktG [“Aktiengesetz”: German Stock Corporation Act], the deductible for the D&O insurance is 10% of the relevant loss, but no more than one-and-a-half times the fixed annual compensation. The targets for sales and trade net working capital are weighted at 30% each. The EBITDA before special items is included in the STI’s target achievement with a weighting of 40%. As part of the future orientation toward EBIT, the Managing Board compensation system will also be converted in fiscal year 2019 from EBITDA before special items to EBIT. The new model will be presented to the Supervisory Board for approval in fiscal year 2019. For the annual bonus in a fiscal year, the targets to be achieved are set in a target-setting agreement between the Managing Board and the Supervisory Board at the start of the fiscal year and by March 31 at the latest. All targets may be replaced by other Group targets or weighted differently for the respective financial year in the context of the target-setting agreement. It is therefore possible to respond to short-term developments at the start of one performance period following the completion of another. The Supervisory Board thus has the opportunity to regularly align the Managing Board’s compensation so that it is directly geared toward the Company’s strategy and its successful implementation. The Managing Board and the Supervisory Board should reach an agreement concerning the targets and their weighting in this regard. The Supervisory Board shall only make decisions at its professional discretion if this does not happen. If the agreed targets are fully achieved on average, the respective member of the Managing Board shall be paid 100% of the contractually agreed amount. Target achievement above the maximum target of 150% or below the minimum target of 75% agreed for the individual target shall not be taken into account when calculating the average. If the average target achievement comes to 150% or more, a maximum amount (cap) of 150% is paid out. If, on the other hand, the average degree of target achievement is below 75%, no annual bonus will be paid. Between the minimum target and the maximum target, target achievement shall be determined in each case by linear interpolation. The annual bonus is payable within a week of the Supervisory Board approving the consolidated financial statements for the fiscal year in question. If the target were achieved in full (100%) for the 2018 STI, a total amount of EUR 1,915 thousand would be paid out (Mark Langer EUR 650 thousand, Bernd Hake EUR 442 thousand, Yves Müller EUR 404 thousand and Ingo Wilts EUR 419 thousand). The degree of target achievement for the individual target components for fiscal year 2018 is summarized in the table below. For fiscal year 2018, the average degree of target achievement is 104% and thus above the minimum target of 75%. The annual bonus is thus paid out in the amount of EUR 1,991 thousand (Mark Langer EUR 676 thousand, Bernd Hake EUR 459 thousand, Yves Müller EUR 420 thousand and Ingo Wilts EUR 436 thousand). Under the LTI program, the members of the Managing Board receive a defined number (“initial grant”) of virtual shares (“tranches”) at the beginning of the plan or at the start of their activity. The initial grant is based on an amount (“LTI budget”) defined in the respective service agreement or by an additional agreement. The LTI budget should roughly correspond to the fixed annual salary. The initial grant is calculated by dividing the LTI budget by the share price for the last three months preceding the awarding of the initial grant. Each tranche has a three-year performance term. A one-year qualifying period follows the expiry of a tranche’s performance term. Following the expiry of the performance term, the final number of virtual shares (“final grant”) is calculated based on the achievement of certain target components. The final entitlement to payment is calculated by multiplying the final grant by the Company’s share price during the last three months of the qualifying period. The “relative total shareholder return” target component is measured based on the increase in the Company’s enterprise value, comprising the share performance and hypothetically reinvested dividends, compared to the MSCI World Textiles, Apparel & Luxury Goods Performance Index. The return on capital employed is based on the development of the ROCE (return on capital employed) profitability indicator versus the budget. The degree of employee satisfaction is measured by an employee survey conducted annually by an independent institute, and the resulting “Employee Trust Index” is compared with the German top 100 companies. The sustainability performance is determined by the Company’s improvement in the Dow Jones Sustainability Assessment, in which the sustainability performance of listed companies is assessed by an index provider. The composition of the Dow Jones Sustainability Index (DJSI) is defined based on this assessment. The targets for the RTSR and ROCE performance criteria each account for one third of the LTI program, while the targets for employee satisfaction and sustainability each account for one sixth. Specific target, minimum and maximum values are defined for each target component and are used to calculate the entitlement to payment. The targets are set on March 31 at the latest of the first year of the performance term in a target-setting agreement concluded between the Managing Board and the Supervisory Board. The Managing Board and the Supervisory Board should reach an agreement in this regard. The Supervisory Board shall only make decisions at its professional discretion if this does not happen. The individual LTI budget in relation to fiscal year 2017 is EUR 900 thousand for Mark Langer, EUR 592 thousand for Bernd Hake, EUR 54 thousand for Yves Müller and EUR 569 thousand for Ingo Wilts. In the case of Yves Müller, the LTI budget is determined on a pro rata basis from the start of his Managing Board activities in 2017. The individual LTI budget in relation to fiscal year 2018 is EUR 900 thousand for Mark Langer, EUR 683 thousand for Bernd Hake, EUR 654 thousand for Yves Müller and EUR 638 thousand for Ingo Wilts. Mark Langer was the only member of the Managing Board in the prior year to have a multiple-year bonus for the years 2015-2017; this was the earlier long-term variable compensation according to the compensation system in effect until the end of fiscal year 2015. For the multiple-year bonus for fiscal year 2015, a degree of target achievement of 3.45% for EBITDA before special items and 4.18% for sales was recorded for the three-year period 2015 to 2017. This results in a payment of EUR 46 thousand, which is determined based on the cumulative target achievement of 7.63% and included in the total compensation for fiscal year 2017. This amount was paid out in fiscal year 2018. For fiscal year 2018, there were no claims to a multiple-year bonus according to the former multiple-year bonus regulation. All claims are related to the current compensation system in effect since January 1, 2016. For Mark Langer, the Chairman of the Managing Board, this is in the form of a benefit-based commitment. The members of the Managing Board appointed from fiscal year 2016 were granted contribution-based pension commitments. This form of pension commitment also applies to any future appointments to the Managing Board. The amount of retirement benefit in this regard corresponds to the amount accumulated by means of the individual employer’s pension liability insurance. This results from the total unpaid pension contributions per year plus an annual interest rate depending on the insurance tariff in question. A member of the Managing Board shall be entitled to retirement benefit at or after a fixed age limit of 65 years or if they become permanently unable to work due to illness or accident and leave the Company before reaching the age limit. In the event of the death of the member of the Managing Board, their spouse or registered civil partner under the German Civil Partnership Act and their surviving children shall be entitled to a survivor’s pension. A pension commitment exists through the Company for Mark Langer, the Chairman of the Managing Board, in the form of a benefit-based pension commitment. The amount of the subsequent post-employment benefit is limited to 60% of the pensionable income in this regard. Post-employment benefits are paid when the employment relationship ends at or after a fixed age limit of 60 years or if the Chairman of the Managing Board becomes permanently unable to work due to illness or accident and leaves the Company before reaching the age limit. Furthermore, in the event of the death of the Chairman of the Managing Board, a post-employment benefit shall be paid to the surviving dependents in the form of a widow’s or an orphan’s pension. If the Chairman of the Managing Board leaves the Company before becoming eligible for a pension, the period by which the benefits become vested is agreed in accordance with the statutory regulations. However, there is no pro rata temporis reduction of the pension entitlement as provided for under legal provisions. In addition, the HUGO BOSS Group offers the members of the Managing Board the option of acquiring additional pension benefits under deferred compensation agreements. This supplementary pension plan can take the form of retirement benefits or, alternatively, the form of occupational incapacity benefits and/or surviving dependents’ benefits and/or the form of a lump-sum death grant. The pension benefits take the form of monthly payments, while surviving dependents’ benefits can also be granted in the form of a lump-sum capital payment. The contributions from deferred compensation agreements are included in the disclosure about total compensation. Provisions and plan assets are recognized at the same amount. As of December 31, 2018, no advance payments were made to the Managing Board. In fiscal year 2018, no members left the Managing Board, meaning that no bonus or severance payments were made to former members of the Managing Board.